Do you plan your bento? One question I get asked a lot is whether I plan my bento. Whether I diligently make menus, complete with ideas on how to prettify and all that. When I first started, I did plan a lot. I’d wrack my brain the day before for bento that was both yummy and cute. These days though, the most usual scenario is me waking up, deciding whether I want to get up, then mostly winging it. Well, mostly and not totally because I still have a fairly good idea of the dish in my bento. I usually build my meal around the protein, whether it’s beef, pork, chicken or fish. 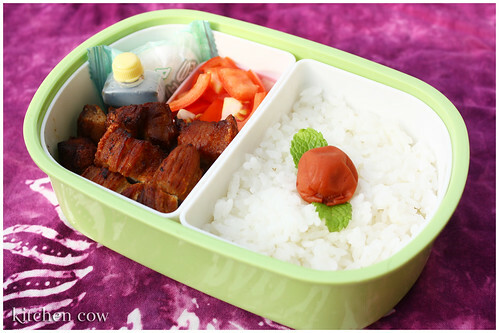 Take for instance this particular bento. Built around the pork belly marinated in soy sauce and vinegar, it came together the morning I was fixing it but I did remember to defrost and marinate the pork the night before. Putting it together was mostly asking myself, “What do we have in the fridge and will it go with the pork?” Fortunately, we almost always have plum tomatoes. Even better, it goes well with the sour-salty fried pork belly. Throw in some rice, (a requisite in Pinoy meals) and my dipping sauce and I have a complete meal. After putting most of it together, I usually forage for things to finish it off, then watch it all fall into place. In this case a marshmallow to plug in one of the gaps and a umeboshi (Japanese pickled plum) and some mint leaves to garnish. Sometimes, it’s even possible to squeeze a charaben out of an unplanned bento when you come up with little gems like, “Hey, doesn’t that ball or rice sort of look like an eyeball?” Of course, that takes longer and is a bit more difficult but it really is possible. How about you? What approach do you take when packing your own bento? 2 Responses to Do you plan your bento? Right now using bento boxes is all about eating regularly and managing portion sizes for health reasons. My method to ‘plan’ them parallels yours mostly except I seldom cook in the morning using mostly leftovers. I use leftovers at times too, but a lot of times, there are no leftovers to pack.